The wand is densely packed and looks promising in terms of volume. The mascara has jet black pigment for a deeper, richer color impact. It is a wet formula and needs quite a bit of patience to work with, initially. The brush also adjusts to multiple angles and combs through even the tiniest lashes. 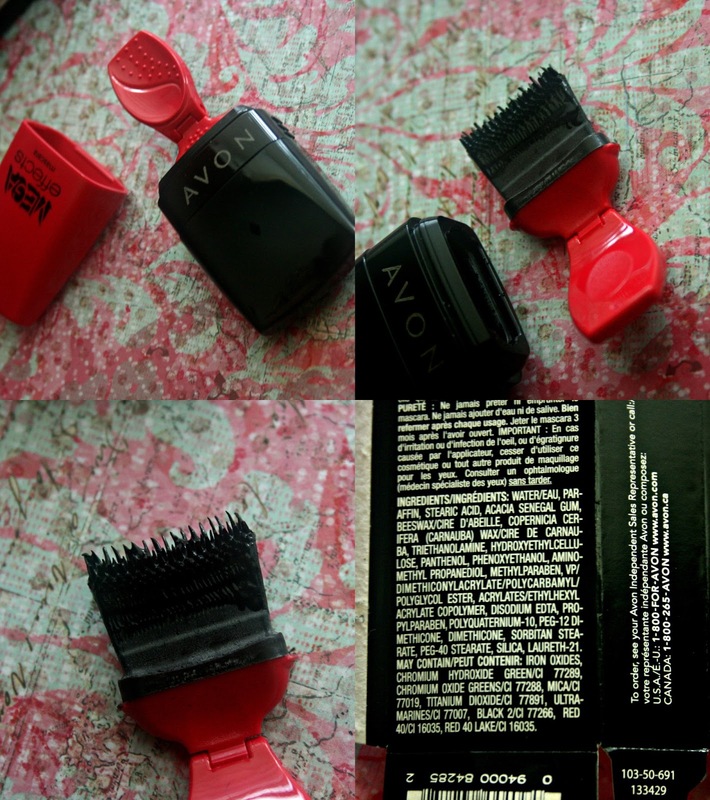 Volume is my top priority and this one is quite volumizing and helps separate and lift my sparse lashes very well. It does however, clump quite a bit on the second coat and since it is very black, I tend to get the pigment all over my eyelids. So, I prefer just one coat which is extremely natural looking. On the plus side, it keeps my lashes curled for a really long time, without weighing it down or making it crunchy. As for the packaging, I really like how it looks, but it can get a tad messy with use. I've been using it for a few weeks now and every time I pull the brush out of the tube, there's a little smearing and smudging here and there. Overall, its a nice mascara for volume - very natural looking, but needs practice and patience to work with. I quite like the concept of using the wand at any angle which can be convenient if you have very short, stubby lashes like mine. What are your thoughts on the AVON Mega Effects Mascara? I think that's the most interesting packaging I've seen in a mascara! Interesting packaging but in the end I don't feel like harassing anyone from the US to get it for me if you know what I mean. LOVE the eye make up. In the end, I'm happy with my Maybelline colossal mascara haha. Harass??!! I love Maybelline colossal too! I thought AVON launches everything there too..